Life has gotten in the way of my Frugal Fashionista series and many of you have emailed wondering where it’s been on Fridays. Well, have no fear, my Frugal designer outfits (for less than $15) happen on a daily basis, but quite often “bedlam” moments get in the way of making those “photo shoots” come to fruition. This month, schedules have gotten in the way of best laid blog plans, so this week is about keeping it real here at Balancing Beauty and Bedlam. Now onto this outfit. It has its problems. Even though its potential for Frugal Fashionista greatness is within reach, I would never put these elements together again. 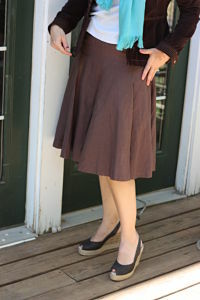 I love the brown and turquoise mix; it’s a beautiful color blend. Yet the scarf/jacket combo is a bit too bulky for the more spring skirt/sandal look. If I had tied the scarf differently or swapped accessories, it would have been much better, but I was making choices at 6:30 in the morn and had to rush out the door. (Clearly, I am not a morning person.) This fully lined designer skirt was a steal for $4, but the hemline hits at the exact spot you do NOT want it too. It needs to fall an inch higher or lower, but more on that during a later post. And let’s not even address the hair issues. Doesn’t it feel great to know we all have bad hair days? When I took these pictures, I had no plans of posting ANY of them, but life is not the photo shopped, airbrushed pictures that we so often see. I want everyone to remember that. We are always our worst critics. You look great and so does the outfit. I actually think it is paired great! Thanks for taking the time to do this series I know it inspires so many to think outside of the box! You look lovely! I really like the jacket and the shoes. I have the same issue as Carmen, I feel out of place in a skirt. You look great… as always. Love brown and turquoise. 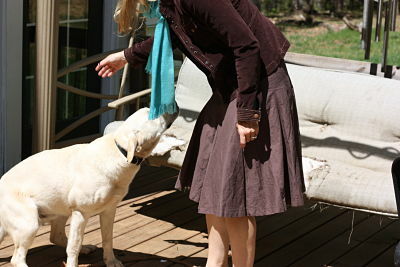 I don’t model my frugal finds (on my post today) precisely because “dog whisperer” moments would no doubt kill the effect! You, however, look great as always! Dog Whisperer? He’s just wanting in on the action, that’s all … got a frugal fashionista collar for the boy? Thanks for posting even though they didn’t turn out as you imagined! I’ve been struggling with making a few scarves (it’s still cool enough in the morning and in AC) look springy! Maybe just minus the jacket (which looks amazingly soft and warm) would make it more seasonal. Not that I ever look that cute walking out the door that early. *wink* You do such a great job of keeping it real. And THAT’S why I read your blog! Your bedlam moments make you even more beautiful, because they show you are a real person living a real life. I love your frugal fashionista posts! Thanks for coming by my blog today! I thought it was a great outfit!! I loved the shoes and thought the skirt looked great. Really! Very cute! Hair looks good, silly. i found this blog the other day and thought i would pass it along to you because i think you would find it interesting. i am pretty much addicted to it – makes me wish i could sew better! girl, you look great! and i love the price…of course!!! come see my new blog soon!! I love your frugal fashionista posts and your blog in general! I always come by and link up Tasty Tuesday and have found so many great recipes! Hahahaha! I don’t think you CAN look bad! And I love your dog’s “smile”! You are AWESOME because you are REAL. Bad hair…..weight gain…..whatever….none of it matters a bit to anyone but you — we love ya’ just the way you are. 🙂 I love the frugal fashionista and you have seriously inspired me to shop the thrift stores like never before (I’ve always shopped them but now I’m digging deeper and finding such great stuff!!!). Keep on writing! The shoes ROCK so what does the rest matter ;-)! I even scrolled back up to take another look, and I still don’t know what you’re talking about. brown and turquoise were my wedding colors, so of course I love your outfit. and you reach for heels at 6:30 am? that sounds way closer to beauty than bedlam! I like your outfit. We are our worst critics. The scarf brightens it up. I am so glad that I ran across a link that brought me to your blog! I had saved you once upon a time and lost the link. I love this series! I too shop most often at thrift stores for my clothing and love to find great items, although I often stay away from things that fit my lower half. It’s time to get past whatever my hang up is. I’ve been catching up with your most recent FF posts. Please post more, I love them!!! ps- I love that you keep it real, we can get fake anywhere else!